Chatbots have the potential to complete many of the tasks currently performed by online workers via utilizing Artificial Intelligence (AI) systems that are capable of fluent conversations with human clients and customers. Chatbots are becoming increasingly influential in day-to-day online life. These applications have been developed to offer assistance in a range of industries -- from simple banking transactions, to eRetail customer service inquiries. The aim of a typical chatbots is to apply AI and cognitive computing technology to streamline routine business processes, such as customer service transactions and eCommerce processes. According to the latest worldwide market study by Juniper Research, chatbots will redefine the customer service industry, with healthcare and banking sectors set to benefit the most from these ongoing application deployments. 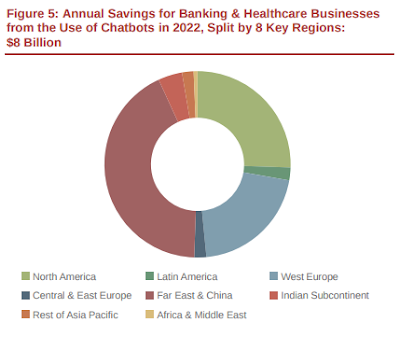 Juniper forecasts that chatbots will be responsible for cost savings of over $8 billion a year by 2022 -- that's up from an estimated $20 million during 2017. Furthermore, Juniper expects dramatic cost savings to be made within the healthcare and banking sectors, as inquiry resolution times are reduced and cost savings are boosted. "We believe that healthcare and banking providers using bots can expect average time savings of just over 4 minutes per inquiry, equating to average cost savings in the range of $0.50-$0.70 per interaction. As Artificial Intelligence advances, reducing reliance on human representatives undoubtedly spells job losses," said Lauren Foye, research analyst at Juniper Research. Juniper also uncovered that bots can handle basic interactions such as healthcare diagnosis, where users can select predefined answers allowing bots to assess health issues and provide a recommended course of action. However, as AI capabilities advance, it's anticipated that bots could be able to aid in more sophisticated healthcare diagnostics. Juniper has forecast that the success rate of bot interactions in the healthcare sector -- those completed without relocation to a human operator -- will move from 12 percent currently, to over 75 percent in 2022. In the banking sector, Juniper expects the rate of interactions to reach over 90 percent in 2022. Meanwhile SMS chatbots, which are likely to be less successful in generating revenues than app-based bots, can offer a ubiquitous service for mass messaging. Governments, for example, could use chatbots in times of national, regional or local emergencies. Juniper believes that application to person (A2P) messaging providers will adopt chatbots as a means to offer information to consumers, and they forecast the volume of A2P SMS sent from chatbot interactions to exceed 100 billion by 2022.